I have implemented a pe:sheet with ajax event="change" like in showwcase, but when ajax completed and Manage Bean change event is done , I need to update data on the sheet. Data are update (YES), but navigation on the sheet too (Wrong)! This is mean, if event change event is fire when you tab on the sheet, you must go to the next cell => this is not work if sheet is update. How is it possible to update data on the sheet without lots layout moving in the cell ? What happens if you remove the update="sheet"? Change "Price" value from positive to negative you will see the cell tab and the style updates from Green to Red with no need to call update="" on the whole sheet? Yes this work if you don't need to update nothing, just take the change like it is. - first, when value is remove or blanck, I would like to put a default value. Than I need to change the newValue on the managed bean like a 'setNewValue()' but this propertyClass doen't exist. I change data value and update sheet, like a dataTable ! Another way to need update the sheet and it is also an issue, it is after the addHook ('afterCreateRow') on the contextMenu : I would like to insert a line whith some default value. I call a bean with p:remoteCommand to insert a new line on database and put default value on it and on the sheet. The only way I found to update the sheet with the default value, it's to use update property of the remoteCommand (Same problem) but in this case user navigation is less important. In fact the need is : How can I do to maintain up to date sheet screen values and data values when one of them change without interact user navigation ? I would like to use JS, and I hope I can do it by JS, but it's not so easily to set right focus place and if I do like this, I loose the advantage to use this component. For exemple, user can tape some value on a cell and he can move where ever he want on the sheet : left, rigth, bottom, or outside .. (with tab, enter, cursor move, mouse click ...) => it's the lost focus who call the ajax event change. So for user need, the update musn't change his current action and he must go where he decide (isn't it), how can I know this place ???. Yep your only choice for that then is not calling update="sheet". You have got to find other ways to do what you want. The whole reason we built the sheet was so you could have 10,000 cells that the PF Datatable did not support well. We wanted cell updates to update just that cell without having to update the whole Sheet. That if you edited a cell then just that cell would be sent in Ajax and updated unlike the PF datatable which would Form Submit all 10,000 values. You are kind of defeating the whole purpose of the sheet by reloading the entire Sheet every time you make an update. I would test different solution, but the best way like you suggest it's to use "standard" and "existing" things. For example, if I want to use required property on pe:sheetcolumn, the work it is different of my need : it only work if you delete an existing value. If you tab or [enter] on theses required cells but if they are empty on load, no required information appear (red color ..) => Strange isn't it, the fields is mandatory, you said it's not like a form validation, there is no whole validation, it's at each cell. Is it a validation bug ? Another problem, when sheet is loaded, I would like required fields appear directly in red for helping users to see where he need to work. How can I do this ? Do you know if it's possible to run something like validate sheet cells at on first load process ? By the way, it's not necessary to put a hundered messages required ! The "validation" only takes place when you edit a cell not when you TAB over one or when the sheet loads. Can you imagine running validation on every cell in a 10,000 cell sheet when it loads? Page load time would increase significantly and the whole reason we wrote the Sheet was for performance. OK I must look on JS solution. But I thinks there are some issues on the pe:sheet update and validation process. There are very difference between required control and validator and it was very nice to have same control for user experience and confort. 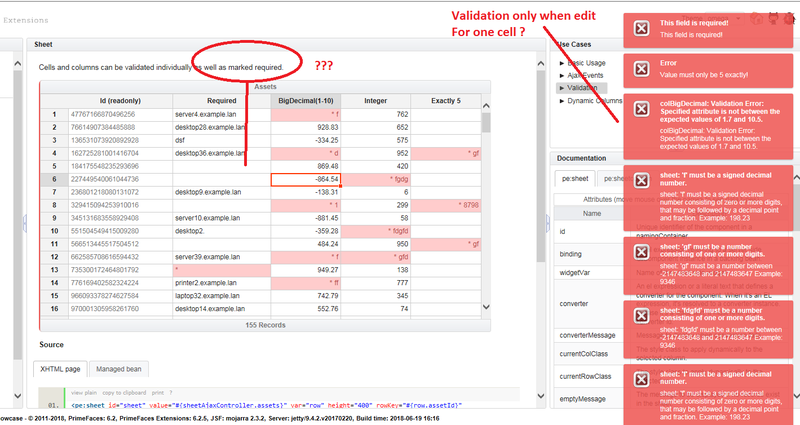 You say only the current cell it's control on edit phase, see this screen shot on showcase just after tab on required field : there are a lot of validation and not on edit and the required field is forget . Hope this can help to improve pe:sheet implementation of handsontable I'm waiting next release ! I will post here different solution if I found some really good !